We are excited to release Picktorial 4 - a major milestone for Picktorial and a free update for all who purchased version 3.5. Now is the time to thank you, our users, who have provided tremendously helpful feedback and comments, and helped make Picktorial the most attractive non-destructive photo editor and organizer in the market. Picktorial 4 has now its own index, rather than relying on macOS Spotlight cache. This gains a performance improvement of 100X. It takes less than 50MB on your drive for 100,000 photos. Picktorial uses a live search, so it updates the results in real time as you’re entering the query and updates itself immediately when the metadata of your photos is changed. Thanks to the new search infrastructure, Picktorial now offers advanced search capabilities by fields that are not supported by macOS Spotlight, such as rating, keywords (tags), capture date, IPTC metadata and so on. You can find the image you’re looking for based on its file name, file extension, rating values of “equal”, “larger than”, “smaller than” and different “and” variations of these. You can also choose where your search is applied, whether globally on your entire image collection or in a specific folder. Picktorial comes with very useful predefined searches to get you started. Save any of your searches, rename them and you have a smart album that automatically collects any image that matches the query, from any folder. Smart albums are updated dynamically and help you cull and curate your image, easily and efficiently. Let you curate multiple lists of photos without making extra copies on your drive. lets you set any album as “quick album” and add photos to it by pressing “b”. Now you can transform any combination of changes you’ve made in one image, to any number of other images, simply by choosing them in the browser. This can be done in a one-click copy-paste function or with great precision using the lock feature that’s in every slider, section or local adjustment. Like batch editing, the export function now supports Batch export, letting you determine the export settings for any number of images, in a single operation. Simply select the images you want to export in the browser, open the export from the File menu or by a right-click on one of the selected images. The exported images will be saved in the location you define in the menu. We gave our browser a complete overhaul to offer an even better user experience and choose between two layouts: Tiled, and Squares. Image layout has been improved and files are now easier to find. Images in the browser can now be sorted by Capture date, Modification date, Name, and Rating, all by ascending or descending order. Just right-click anywhere on the background and select Arrange By, to see the menu. If you shoot both JPEG and RAW formats, this feature is for you. 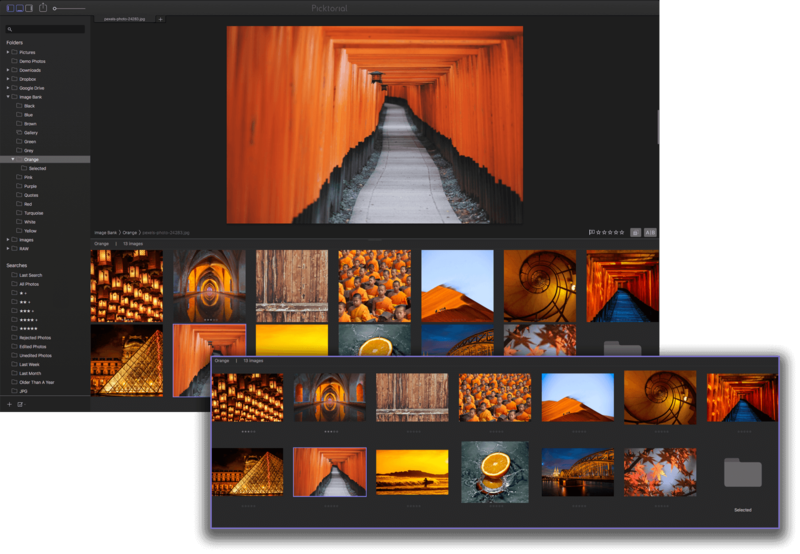 Picktorial enables you to stack together JPEG and their corresponding RAW photos and choose which format of the two will be used by default when editing. If you use high-end multi-megapixel cameras like the Nikon D850, Fuji GFX50s/r with their 50mp’s or even a Phase back with 100mp’s, Picktorial will have it on display like any other file, with smooth live editing and zooming. This feature recalls disconnected folders and files of a connected external drive or a NAS server, automatically, over ethernet or WiFi, so you can continue to work seamlessly anywhere. We’re happy to be the first to take advantage of Apple’s latest interface improvements and have Picktorial displayed with your favorite color scheme for seamless transitions between programs. Picktorial’s interface with automatically adapt to the chosen accent color in the Apple menu. We’re utilizing a unique and less-known feature of the JPEG file format, in a new way. This feature saves all editing information within the file itself, so you can adjust any edit later you JPEG file later on at any point, and still have all your adjustments ready to be modified just like a RAW file! You can also easily revert back to the original file at any time and start again. The saved file will present the changes made while having the history inside it. Another very useful feature to help you become better at your craft. With a single click, you can display the chosen focus point used in the camera when the image was taken. Picktorial 4 is a major step forward, and we are already working on further improvements and new features coming in future updates. If you can’t find your most desired feature in Picktorial 4, please email us - we believe that user feedback is the best way to make Picktorial the finest photo editor in the world.